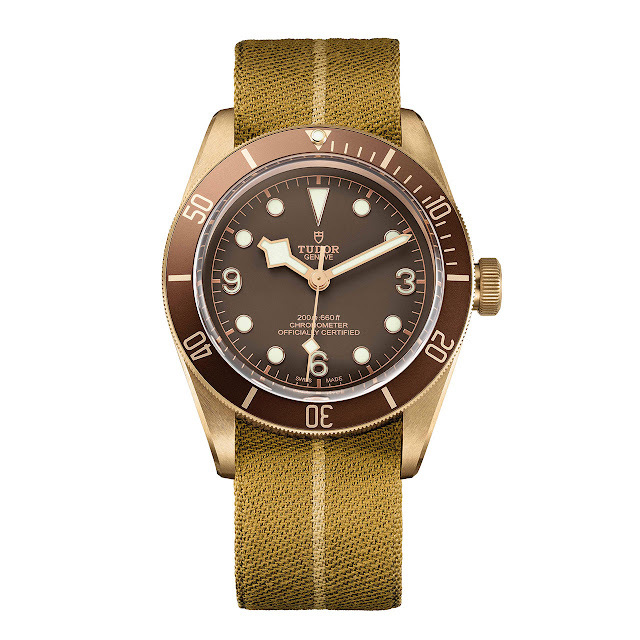 This piece inherits the most characteristic elements from Tudor's eloquent history in dive watches: the domed crystal, the prominent winding crown from the 1958 model, dubbed Big Crown, the angular "snowflake" hands from the 1970s, and the beige woven jacquard strap, a nod to the French sailors who made their own straps from elastic recovered from rescue parachutes. The bronze case is a reminder of the bronze used for the helmets in the heroic early days of diving. 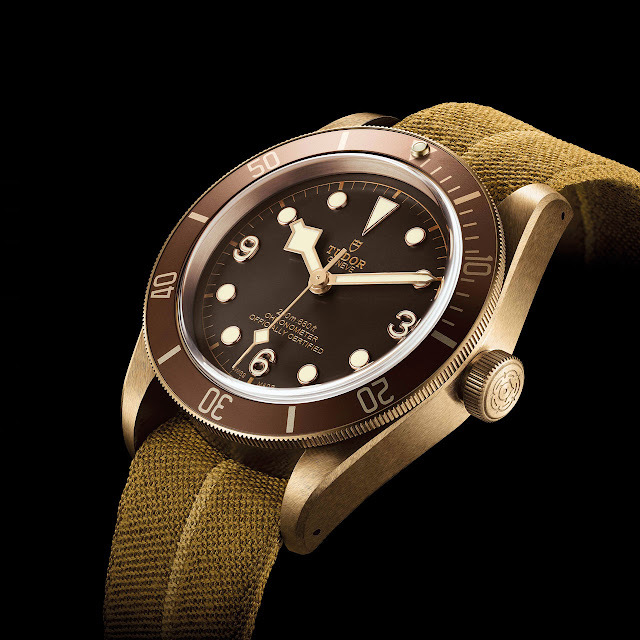 Add to this a mechanical automatic movement with COSC chronometer certification, - developed, manufactured and assembled in-house – and there can be no doubting that this new Black Bay Bronze will become a partner for life, slowly developing a unique patina over time to match its owner's lifestyle. Mechanical automatic, MT5601 calibre, 28,800 vib/h, silicon balance spring, approximately 70-hour power reserve. Bronze, 43 mm. Domed sapphire crystal, steel back with bronze-coloured PVD treatment. Unidirectional rotating bezel with brown anodised aluminium disc. Water-resistant to 200 metres (20 bar/660 ft). 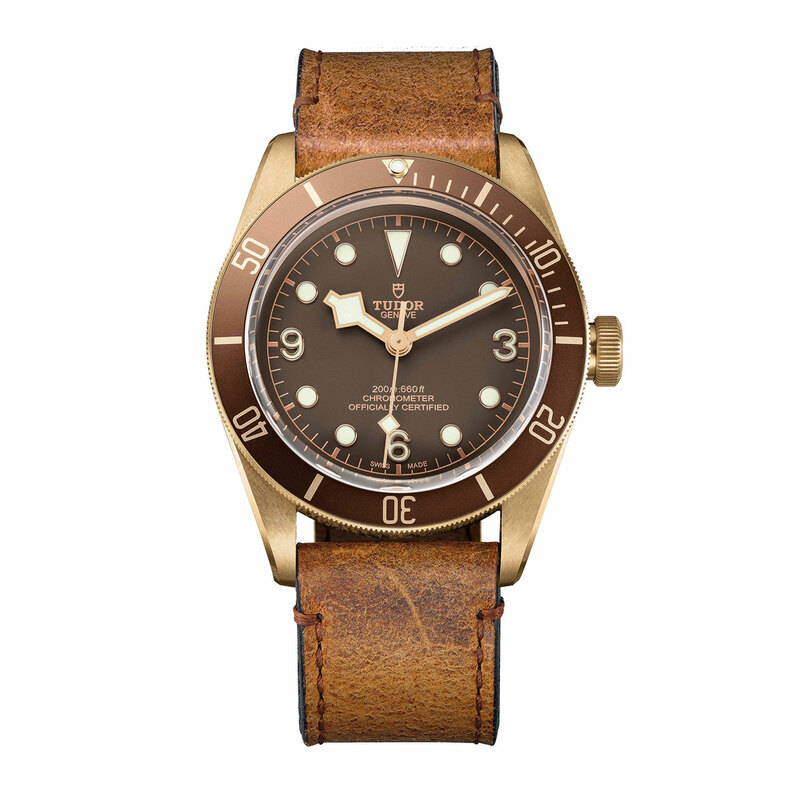 Antiquated leather with bronze buckle. Delivered with a second, fabric strap.